We serve Minneapolis, Superior, Duluth, and many nearby areas in Minnesota and Wisconsin. At DBS we provide complete, professional solutions for foundation repairs of all types, including bowing, buckling foundation walls. Our wall anchor system includes a 25-year warranty against manufacturing defects, as well as a performance warranty from us, and is fully compatible with the Hide-A-Way® Wall Anchor Cover System. 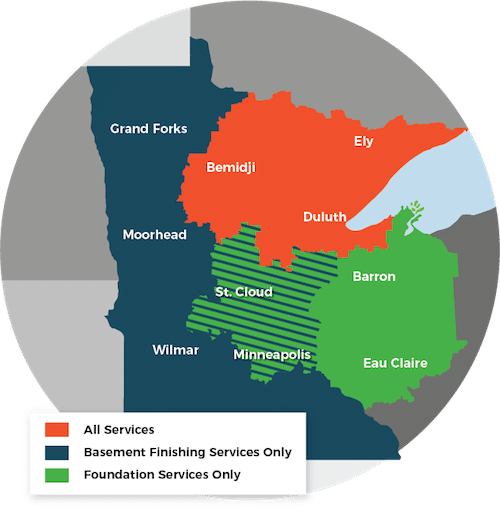 We proudly serve Superior, Duluth, Minneapolis, and many other parts of Minnesota and Wisconsin.